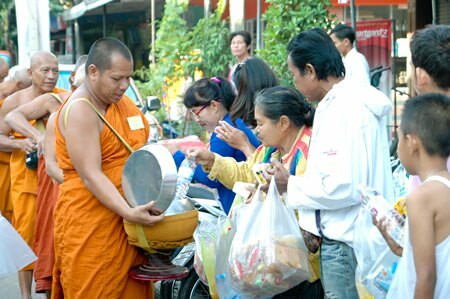 Naklua-area residents gave alms to 87 monks ordained for HM the King’s birthday in the final days of their 10 days of service. The monks, who left the order on Dec. 11, walked a route from Pattaya School No. 3 through the Naklua Market to Lan Po Park Dec. 7 to receive alms from those seeking to make merit to honor His Majesty on his 87th birthday Dec. 5. 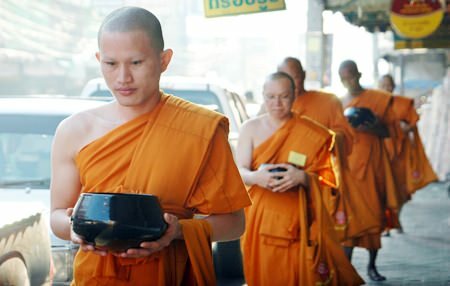 Since starting their 10-day monkhood experience, the young men stood for a mass ordination ceremony then went to Jittapawan College to study and practice dharma and missions according to principles of Buddhism. 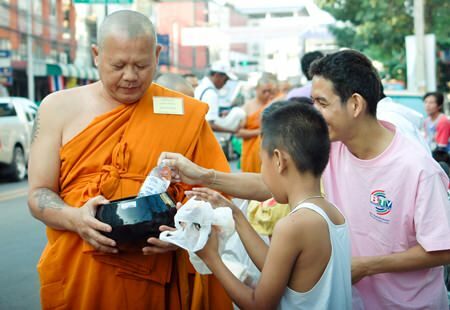 People in Naklua line up alongside the road to present alms to monks who ordained in honor of HM the King’s 86th birthday.